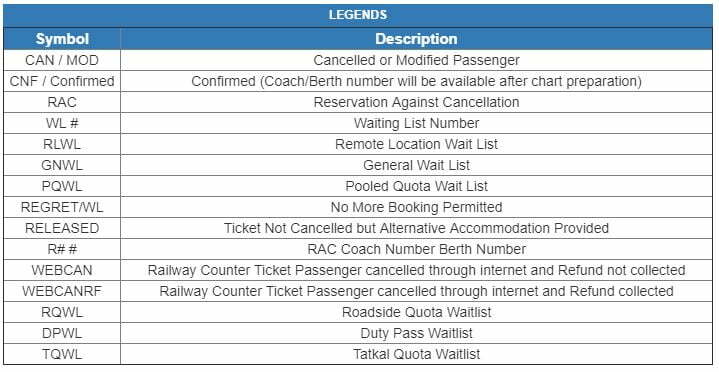 IRCTC WL (IRCTC Waiting Lists) status denotes that your reservation was not yet confirmed and do not have a confirmed seat for travel. In case someone cancels the ticket, the ticket moves to front in the waiting list queue. On some special occasion, there is the chance to get seats in the extra bogies which may be attached to reduce the WL queue. The status of ticket can be checked using the 10 – digit PNR number on any railway station or online. This is the normal waiting list status which will suffix with number. For example: If you get WL 5 status then 4 people have booked before you. Your waiting list number will move up if the confirmed ticket or the above waiting list tickets get cancelled. RLWL tickets will be issued to people who booked tickets between intermediate stations which are in an important and big cities lying in a particular route. Its provided with a separate priority and confirmation. This type of wailing list will get confirm only when the confirmed ticket with same source and destination is cancelled. For example, ticket is booked from Chennai to Salem with RLWL status. Then this ticket will get confirm only when another confirmed ticket cancelled which is booked from Chennai to Salem. Since there is no RAC provision, it has very less chance of confirmation. It is a ticket booked from intermediate to another intermediate station and this is not covered by remote, pooled (PQWL) or general quota. A ticket is confirmed only when there is a confirmed ticket for travelling from intermediate station to intermediate station. PQWL tickets issued to people travelling from source to intermediate or intermediate to intermediate or intermediate to destination. It is shared between many small stations. Usually pooled quota has only one for the entire run. The chance of confirmation is very less. It is confirmed after the confirmation of other type of tickets. LDWL is only for ladies and will be issued to Ladies compartment. When people books ticket in office of originating station, they will get GNWL status and it has high chance of confirmation. CKWL refers to the tatkal waiting list. Ticket gets confirm only when a confirmed tatkal ticket get cancel. So chance of confirmation is very less comparing to GNWL. Tatkal can be booked one day prior to the journey date. for CKWL, you won’t get RAC instead can expect confirmed berth. RAC status refers that ticket will have high chance of confirmation for full berth before chart preparation. At least you will have chance to get sitting seat (half berth) in RAC. CNF refers to the confirmed birth. You should get the birth details instantly or later in the chart. WILL IT B CONFIRM ? My current status is TQWL- 4 from CSMT to Mathura Jn for tomorrow in Punjab Mail(12137). What r my chances of confirmation ???? Hii sir.. i have 2 ticket booking in mahanagri 11093 train from mumbai to varanasi on 25th oct 2018 and my current status is WL38 and WL 39 .will it be confirmed? Could you please confirm me whether my ticket will get confirmed or not. I booked in Kalka from Howrah to Hathras on PNR 6419931060 in tatkal.Booking status is TQWL 12 n boarding is on today.Pls revert the chances of Seat confirmation. Kindly let me know if there is any chance for the tickets to get confirmed. And journey date on 20/sep/2018. 4 TICKETS So whether tickets get confirmed? PNR no.4702893240, chart prepared but still showing chances of confirmation as 81%. Whether it get confirmed at last moment? Shall I waite or should find out alternative transportation? My PQWL waiting list 3 & 4 now for PNR 4658666443. will it be conform? Hiiii admin my pnr no 2513379907 and my journey dt is 23 sep what is chance of confirmation………. Hi Umesh, I could say the chance of confirmation is 60%. Better plan for alternate transport. What are the chances of confirmation? Sir I have booked ticket from secunderabad to tirupathi In Narayanadri Express. Date of journey is 12th sept. WL 70,71,72,73 in SL. Pnr is 4702737908, what are its confirmation chances? Could you please tell me that will it be confirmed by the travel day? My booking status shows as RQWL1&2. Hi Mohan, both the tickets will be 100% confirmed. Advance happy journey. Any possibilities that it be confirmed? Hi Abhijit, seems you have cancelled the ticket. Apologies for the delay. My ticket is from Surat to nadiad. Waiting is PQWL136/WL119 .is it will confirm? Hi Uchit, Please provide your PNR number or date of boarding? as of now i had booked my tickets 120 days before we are 6 adults and one 11 year child. as in general quota tickets where on waiting so i got 2 tickets as in SR. Citizen and rest 5 in WL 66. I will be travelling on 28 dec 2018 from tirupati to rameshwaram. My PNR no. is 4448738737. What are the chances of confirmation ? Hi Tanvi, All the 5 tickets will get confirmed. Don’t Worry. Advance Happy Journey! I have one more query if my tickets wont get confirmed or NOT even RAC so can we travel on our confirmed berth of my parents which are on another PNR. My PNR NO is 4560942476 Traveling on 31st Aug from Chennai to Hyderabad on Hyderabad express on 2-tire ac. As of now Status is WL/12. What is the chances of getting confirmation sir? Hi Praveen, Sorry for the late response. Your ticket seems confirmed. Hi Renish, 100% all the tickets will get confirmed. Thanks. Hi Renish, luckily 100% all the tickets will get confirmed for this PNR too. Thanks. Hi Rao, Please cancel the ticket and try for alternate transport. After today chart preparation my current booking status is RLWL 2 will it will be confirmed in coming 4 hours. After today chart preparation my current status is RLWL 2 will it will get confirmed in coming 4 hours. I am amit i want to plan my travel on date 28.07.2018 from malwa express from jammu tavi to indore. is there is any change in 2nd AC as currently it shows 84% probability of confirm the ticket. Sir…I HV ticket wl19/7 in darbhanga pune express…..on date of departure from Allahabad 30/06/2017….how much chance to getting confirm…. Sir my train ticket is TQWL 2&3 For 2AC From new Delhi to Kokrajhar on 14/06/18 PNR is 2728237448 how much get confirm. My waiting list list is 11, 12, 13. Will it be confirmed by tomorrow? Hi Admino, Please provide your PNR number to check for the details. I have booked a ticket for COROMANDEL EXP (12842) for the date 29/06/2018. Now the status is PQWL/17. May I know the chances of confirmation ? I want know that on9th June new delhi to gaya bhuvaneshvar rajdhani . 2ac 1 waiting . It will be confirm or RAC or no. If not then can I travail as a waiting.my ticket bood from counter. Hii .. sir .. mera 49 waiting hai Poorva may. Present status of my ticket is WL/ 5,6,7 in Neelachal exp fro Tata Nagar Station To Lucknow on 13th May. what is the possibilities of confirmation? I have booked a ticket from yashwantapur (YPR) to Dadar(DR) in chalukya express with RLWL 4 with travel date 22/05/18 will it get confirmed..? I have booked a 3AC class ticket from YSP to DR with RLWL 4, date of journey is 22-May-2018 will it get confirmed..? HI my waiting list is WL/23 from Yeshwantpur(Banglore) to NZM(Delhi). PNR number is 4863967337. Sampark Kranti on 10 June 2018. PNR 8104250337 Train No. is 11013. Class is 2A. DOJ 02-05-18. First passenger status is CNF and second is PQWL5. please apprise the probability of confirmation for the second passenger. Can the second passenger board the train even if ticket is not confirmation? Both the passengers are senior citizens. My Ticket’s PNR Number is 8700682807 in Train No.11067 from LTT to AME on 28.04.2018 shows WL 29,30,31. Is there any change for confirmation. Hlo sir.. My ticket is on 6th May 2018 for 3A coach and the WL is 8 ..will it get confirmed sir..? My pnr number is 6513277367. Now 12 WL in patna Vasco train no 12742 on 28 apr 18. Only 4 days left will it confirmed?? Will i get the confirmed ticket. Will my ticket with PNR number 4143151432get confirmed? I have journey on 28/04/2018 and i have WL 8/6 in 3rd AC for Ajmer Express(12989). Hi. I have booked a ticket in Hatia-Pune express Train no. 22846 in both 3A and 2A for date 01-06-2018. My ticket’s current status is GNWL 2 for both the tickets (3A and 2A). Will any of the ticket get confirmed 100% ?? I have journey on 27/4/2018 and i have GNWL of 39 in 3rd AC for Ahmedabad Jammu tawi express. Will it get confirm?? I have booked ticket from bangalore to manmad in karnataka express. My Waiting list is 29 in 3rd AC. Will it get confirmed or not? Since the boarding date is 27-4-2018, you ticket will get confirm 100%. So don’t worry. Will my ticket get confirmed for pnr no. 4142438778. Please let me know. Refund will be automatically credited to your bank account within 3 to 7 working days. RAC 13 14 in Avadh exp. On 8april 18 will it be confirmed. I booked my 3AC ticket in Garib rath from New delhi to ranchi TRAIN NO-12878 ,journey date is 12.04.2018 and ticket status is showing WL98 ON 31ST MARCH 2018,Birth will confirm on that date or not? Hi Admin GNWL217/WL75 train 17235 source: HSRA dest: VPT journey date 30-Mar-2018.. please confirm the possibility. For Garib Rath Secunderabad to Visakhapatnam on 07-Mar-18 the present status is GNWL183/WL124.Is there any possibility of getting confirmed? Hi Venkata, chance of confirmation is 50%. my current pnr status in train no. 19166 sabarmati express is RLWL 25. i have booked ticket bt lucknow to anand jn. date of journey is 7 march. will it get confirmed or not? Hi, Admin my current PNR atatus shows RLWL 10,11. my Journey date is 08th Mar in GHY SC EXPRESS will it get confirmed or not? I have booked my ticket in AVADH EXPRESS (19039) 2A on 27 Feb… current status is RLWL 9…will it get confirmed or not??? Please mention the Journey date. Hi Sai, Change of confirmation is very less. Please plan accordingly. Hi Admin my ticket is WL 29 for 3 tier AC kamayani from LTT to JNH. My ticket for Cheran exp from MAS to ED was at General WL 15, 16, 17, 18. Please let me know whether it will get confirmed. I’ve RAC 11 in 22476 Bikaner ac express in 2nd ac for tomorrow from Coimbatore to Bikaner. What are the chances of confirmation? What is the chance of confirmation.? My ticket shows tatkal waitimg list 48,49 in 12445 ,3AC on 29/09/2017,Will any chance to confirem it? My journey date is 27th Sep 2017 by Amritsar Mail from HWH to UMB pnr no 6702459352 in 3 tire ac vide GNWL 56,57,58, 59, 60, 61 and the present standing is WL 8,9,10,11,12,13. Is there anY chance of confirmation?? WL7 & 8 in kolkata jammu tawi exp. from Dhanbad to Jammu on 15 Sep 2017.. what are the chances of confirmation? WL75 76 77 78 in lucknow mail from new delhi to lucknow on 23 june.. what are the chances of confirmation? Hi Ankush, Very low sorry. I have Sleeper PNR status as RAC27 and RAC28. Could you please advise if it will confirm after chart preparation. My Travel Date is 2nd June,2017. is there any chance of confrmation ??? Will my PNR 2331910664 get confirmed ? Hi my train 12716-ASR NED Express, current waiting list is 14,15,16 for three tickets. Departure date is 02-06-2017. What are my chances, I have little babies. PNR 2712732013. Please reply. i Booked 2 Tickets Chandigarh to Kolkata on 21 may for 12th June 2107 in Kalka mail 12312, it’s showing RLWL-4-5, will it confirm or i should go for Tatkal?? my Ticket is RLWL-5,6 in Tran no 12312 Chandigarh to Hawra in Kalka mail on 12 june 17, will it confirm or not?? PNR	4431725994,WL5 on 21 may 17 ,will it get confirmed ? I m booking 2 tickets in kamayani express travelling Mumbai to Allahabad on 20 april 2017 today current status is WL 13 any chance for confirmation ? MY TRAIN NO 12838. MY TICKET WL 4 & 5 in 3AC. WILL IT BE CONFIRM? MY TRAIN NO 12838. MY TICKET WL 4 & 5. WILL IT BE CONFIRMED? my train number is 11058 ,i have 9 waiting in 3A.and my travelling date is 4 march. it will confirm or not? Plz tell me,PQWL49 will confirm for charminar exp.12760 on 14 nov.2016 if i book the ticket? Hi i have booked Rajdhani for tomorrow in 3A with WL 8 from Hyd to BLR. Can some one help me what is the chance of getting it confirmed. hi my ticket WL 7 and travel time after 6 hour is there any chances to confirm? Hi. I have got WL of 4 in 2AC from Mumbai to Hyderabad for 4 sept 2016. What are my chances of ticket getting confimed? Please suggest. pnr : 8405792430, RLWL/ WL21/22, PLEASE ADVICE WHAT TO DO ? sir i have 21wl in train no.19020 from Ahmedabad to Delhi at 21:00 on 02 November16 can it get confirmed. sir i have 38gnwl in train no.23010 from koderma to howrah at 22:53 on 15th august 16 can it get confirmed. PQWL 19 & 20 is possible for confirmation pls revert ………………..
pnr : 6756058940, RLWL/ WL20/21, PLEASE ADVICE WHAT TO DO ? CAN I BOOK ORIGINATE STN TO DESTINATION STN. IT IS WL8/WL6 (SAME DAY, SAME TRAIN) ??? I have booked the tickets from CSTM to wadi by Udyan on 12/5/2016.It shows one confirmed and other Wait list 1. I have also booked tickets from Wadi to Sbc Bangalore by Udyan on 12/5/2016 and they are both wait list 1 and 2. I HAVE BOOKED THE TICKETS FROM VIZAG TO NEW JALPAIGURI ON 19.05.16 & MY WAITING LIST IS RLWL 40- RLWL 45 COULD YOU PLEASWE SUGGEST WILL IT CONFIRM OR NOT ??? My PNR No is 264 3928381. Will my tickets be confirmed? CSTM in train no : 11058.
done after payment this has booked on WL 1. Can you pls advice if this can be confirm. is there any chances of confirm..? I Have book tickets in pune howrah duronto 2nd AC.waiting list is 19 and 20.what are the chances of confirmation…? I’ve booked tickets from haridwar to ratlam.. current status is WL 20 and booking status was WL 70.. have to board the train on 27th april 2016.. Any chances of getting confirmation? You may try booking for tatkal. Booking starts at 10 am on the day before the scheduled departure of train. If you book quickly you can book your tickets. Max 4 tickets allowed per id on irctc site. Hi our jouney on 17th Mar in 12413 Delhi to jammu & We are 24 people & Booked ticket on 2nd mar.we are 6 Ticket in 2nd a/c & Sleepar 18 Seat.we are wait list 2nd a/c 15 To 20 & Sleepar 45 To 75 Wait list pls advise its possible. MY Train No 19039 .Avadh Exp From Agra Fort to Gorakhpur. Travelling Date id 22 April 2016. My Booking Status GNWL 16,17,18,19,20. I booked ticket in Feb15, 2016. My Ticket Current status is Still same as time of booking. What is probability of Confirmation of my Ticket? Hi, I have booked a ticket in Nilgiri express from Coimbatore to Chennai for journey on 10/Apr/16 in second A/C. Waiting list is 1. Will my ticket get confirmed? Hi.. I have CKWL 4 and CKWL 5 in my reservation for tomorrow nights train (HWH – VSKP at 835 pm).. what are the chances of confirmation? I m travelling on 24th night. I have RLWL1/WL1 from Gwalior to new Delhi. What are the chances of confirmation? hi my train is on 23/01/16 hwr-pbr express train no-12906 my ticket status is RLWL7/RLWL2. please tell me the possibility of conformation. What are the chances of it being confirmed or at least getting an RAC?? My Ticket is From Vijayawada to Srikakulam road for Falaknuma Express for Tomorrow’s Journey.. and Present status is W/L1 to W/L 6 in 3AC, How many chances are there to me to get atlease RAC..? my waiting list is wl33 to wl36 in Blr express from allepey to bangalore on 16th January. will it get confirmed. I have journey date on 16th Jan in BLR express from Allepey to bangalore. Waiting is WL33 to WL36. Any chance of confirmation..? Today,my waiting list is GNWL14 in bangalore to thanjavur in mysore express in 3A …travel date :- 22/01/2016…if there is any chance to confirm? train no: 12839 , 3AC CKW/L 2 . Date of journey 10-01-2016! howrah to chennai! Any chance for conformation? SL GNW/L 369 is it better to book a ticket in sleeper cos later there is a chance of adding extra coach? Hi, my ckwl is 15-18(4 seats) in 19031 yoga express from Sirohi road to Delhi can’t what is the chance of confirmation. I have a ticket for 14.2.2016 in 19032 having status of W/L 3 and 4. is there chance of confirmation ? I got 24 waiting on 25/1/16 from MADGAON-NZM in 3AC of Rajdhani, is there any chance of confirmation? i have done the tatkal ticket form SC-BBS in Konark Express. and it is in CKWL2 in 3AC. Will it get confirmed or shall i try for other train in tatkal. plz udate me ASAP. sorry Ganesh no chance of confirmation. What is the chance of confirmation ?? I have a wl ticket journey date 26-01-2016, showing status wl-8 to wl12 train no.12864 tirupaty to howrah,any chance of confirm. WL20 IN 15008 LUCKNOW MUDHADIDH EXM 3 JAN..IS ANY CHANCE OF CONFIRM? my ticket is on gnwl wl22 for 31st dec 2015 will it be confirmed? I am traveling on 21st-Jan-2015 I have booked my ticket on 24th-Dec-2015 it is in waiting list 1st second A/C Train name: MAQ VIVEK EXP (Train Number :22851) SRC to KGQ on lower side breath please let us know it is any chance to confirm the ticket? Hello i have reservation in gorakhpur yashwantpur and still its not confirmed it has waiting 7. Train has started from gorakhpur i will be boarding at betul. please let me know when chart will be prepared and what are th chances of confirmation. I have booked 2 tatkal tickets in 2nd AC ahmedabad to new delhi. One is confirmed & second one is waiting so what is the chances confirm? or Can i travel with that waiting ticket in 2nd AC Coach of Rajdhani? Hello admin I have WL 13 in A/c 3 in DBRT rajdhani of the date 26.12.2015. What are the chances of confirmation???? Hi! Mine is CKWL1 & 2 for 24/12/2015 Sealdah to NJP Darjeeling mail AC II. What are my chances of confirmation? You have 0% chance of confirmation. Please plan for an alternative way to travel. Happy New Year. I have two tatkal Tickets CKWl 1 & 2 i.e., the status of these two tatkal 3 tyre AC tickets is waiting 1 & 2. The train is tmr night at 9:30pm. What is the possibilities of confirmation. My ticket is w/l 18.departure is on tommorow 2.20pm.what is the chance of confirmation? My ticket has GNWL 90 as of now and train travel date is tomorrow i.e. 23 Dec by Pune-Nagpur Garib Rath. What are the chances of confirmation? I am travelling with kids. I heard that Garib rath has extra coaches and they add them if the demand is more. I am Travelling on 30th from Howrah on Traing # 12839 which goes to Chennai. Booked One ticket on 30th Nov with WL 18 but, at present it has only moved up 2 positions. Is there any chance of ticket confirmation? I am travelling to Hubli(UBL) from Bangalore City (SBC) on 24th December by Ajmer Exapress. When I booked tickets , WL47,48,49 and 50 . Now the status is WL-33,34,35,36. Any chances of getting confirmed.? RLGN WL 15. Is there any chance to get confirmation? Still 15 days to boarding date. You have 90% of RAC confirmation. I have RLGN WL 15 and 16 on 8th Jan 2016 from H.Nizzamuddin to Madurai. Is there any chance to get confirmation?. My ticket from Kanpur to dibrugarh in Train No 12424 Dibrugarh Rajdhani RLGN WL-1 in AC-II on 27th Dec 2015. chances of confirmation??? No worries. You have 100% chance of confirmation. I had my ticket on 23rd Dec in Gorakhdhaam express. Sleeper waiting list is 28. Will it be cofirm? Hi Alok, it should be confirmed but since 25th is Christmas, you have 70% of confirmation. Please plan for alternate transport if possible. I have booked Suranagari Tatkal ticket having CKWL 5. Will this get confirmed? i have booked in coromondal exp on 24th dec rac-7 in ac-2 tier.any chance of confirmation? Will this one will get confirmed…..
My journey is on 2 dec 2015. PNR NO 4313754246. Status is GNWL 20, RAC 61. can u tell me the possibilities of confirmation. You’ve already got Side half seat, and your full birth confirmation chance is 100%. so don’t worry.. Chart is prepared and still my ckwl is 2, is it already cancelled or are there any chances that it may get confirmed during second chart preparation ie half an hour before the departure of train? Hi, I have 3 AC ticket b/w new delhi and samastipur, dated 14th, nov’15 and current status is RLWL 47. Is there any chances of getting this confirmed? Moreover, In the last 15 days it has moved just 2 seats(at the time of boking this was RLWL 49). Pls suggest if any one has any idea about this. I am really worried about this as I have to go on that date. Hi I am travelling in Coimbatore JAIPUR Express from Chennai to Bhopal. ARE THERE ANY CHANCES OF CONFIRMATION. .ARE THERE ANY CHANCES OF GETTING CONFIRMED. I am travelling on 7th nov from gandhidham to kamakhya in 3rd AC.My ticket is in waiting list GNWL81/WL37.what are the chances of the ticket get confirmed? Any chance of it getting confirmed? I have booked 2 tickets in Goa express from Ahmadnagar to Vasco for date 15th December and 16th December and both have 2AC WL2-3 and 2AC WL3-4 respectively. I have also booked a return tickets from Madgaon to Nzm for 2 different dates- 21st Dec Goa Express 2AC WL4-5 and on 23rd Dec in Trivendrum Rajdhani 2AC WL7-8. Could you please tell me chances of confirmation of these tickets. see 2AC get no incidences of cancellation therefore it could be possible that won’t get confirmed (honestly 45-55% chances of confirmation). Secondly, see the waiting quota (WL/ RLWL/RLWL) as it is also based on that. favourably, still have so many days (DOJ), so could be! Waiting List 90 Ahmadabad–> Pune Dhuranto Travel date 25 Oct..what are the chances of confirmation??? hi my journey is on 16 OCT 2015 in Kacheguda Vasco da gama waitlist saying GNWL 83/ WL 40 what are the chances of Confirmation . Hi I have booked ticket in tomorrow Shatabdi Express to Chennai and it is W/L13. Any chances to confirm? Booked tatkal ticket from NDLS-BSB by Swatantrata express for 6 June 2015. My tickt status is CKWL 9 and 10. If chances are less can i cancel this ticket and try for next date? I have a tatkal waiting list of 3 in train no.16316 for 30/05/2015. from kollam to Bangalore. so what is the chance of confirmation. Hi my travel date is 7th may 2015, from Visakhapatnam to Chennai (Coromandel Express). I booked 2AC. Status as on 5th may 2015 is RLWL1. I seeing the same status since the time of booking my ticket 60days ago!!!. Is there any chances of Confirmation?? I have rlgn 22.23.24. wl Doj is 01.05.2015 in marudhar express 14864 will it be confirm ? I HAVE PQWL 22 WAITING FROM BANGLORE TO AHMEDABAD IN JODHPUR EXPRESS ON 25TH MAY 2015..WHAT ARE THE CHANCES OF GETTING CONFIRMED? I have a tatkal waiting list of 10 in train no.12905 for 29/04/2015. from ahmedabad to tatanagar. so what is the change of confirmation. I have a ticket with pNR 8633185417 from Borivali to Gorakhpur on 2nd may and it is w/l 8. What are the chances of getting confirmation or RAC? would you advise me book another ticket by any other train or wait? till when it Will it get confirmed ? Travel date 17.04.2015, Duronto Express 12273 from howrah to New Delhi. Sleeper class. kindly let me know if this may get confirm. KIndly also let me know if I need to buy a tatkal ticket if available and cancel this or wait for this to get a minimum RAC. The same for the return from NDLS to hwh. sir,i have 2 tickets of howrah NDLS duronto exp 2 tier with GNWL 3 &4 on 15 th MAY.what are the chances of getting those confirmed?would you like to advise me to book another ticket? I have ticket in Madras mail 12839 from howrah (HWH) to brahmapur (BAM) in 3AC, booking status W/L8 to W/L19, PQWL, current status shows W/L5 to W/L16. Journey date 24.04.15. Please somebody advise whether it has chance to get confirm. i have booked 3 tickets from NZM to MMR in MNGLA LKSDP EXP in 3Ac on 2 April and its is W/L 33,34,35. what are the chances of getting confirmation ? would you please advice me ? I have a ticket with pNR 2403448074 from Nizamuddin to Chennai on 27th march and it is w/l 1. What are the chances of getting confirmation? would you advise me o book another ticket by any other train or wait? hello sir, I have CKWL 2 waiting. What is chance to get confirm ? Hi Bipin, please mention your journey date? i have ticket of 12424 rajdhani on 29th april of three passengers with one confirm and two rqwl 1 and 2. what % probability to get it confirm? Present Status is PQWL 30 My Journy Date is 10 Of this Month Between Dadar To Raichur.can you Please tell me the changes of confirmation. If the CKWL/55, So it is difficult to confirm. I just want to know is it possible to travel on the same train with E- Ticket. for hussain sagar express. i booked 3 tier A/C. can you tell me the changes of confirmation. Hello Sir, I have tkt CKWL 4 for Sabari exp from Secunderabad to Coimbatore for tomorrow 11th Feb. What are the chances for confirmation? Hi. I have GNWL 2 and 3 , in ac 3 tier for journey from pune to ald on 22 Feb 2015. Can anyone advice on my chances of getting confirmed tickets? hiee, I have booked 2 tickets today i.e, 5/2/15 in TATKAL for 6/2/15 and my status is CKWL 55/56. Is der any chance of Confirmation?? If not will my amount will b refunded automatically or shud i cancel?? Please let me know!!! i have made booking in DARBHANGA EXP pune to darbhanga my ticket date is 1/4/2015 and i m getting RAC 35 is their chance of getting ticket conformed before date comes…..?? Had RLWL 18 / RLWL 18 at the time of booking 15 days ago for Madgaon via Okha ERS exp . It is still RLWL 18. When I book new ticket today, I am getting RLWL 28 (booked status) / WL 28. So, RL WL status has not changed to WL status in older booking whereas new booking provides latest status to WL. Hi. I have GNWL29 for journey from MAS to NDLS on 13th Feb 2015. Can anyone advice on my chances of getting confirmed tickets? i booked 2 tickets for 10111 train number from thane to kudal, date of journey is 20th March and i have 100 waiting list. So chances are there to confirms these tickets???? I have booked two tickets for 6 Feb 2015 in Train 12424, NDLS to NJP. One ticket is confirmed and other is RQWL/1. What are the chances of it getting confirmed. Thanks in advance for the response. I HAVE BOOKED 2 TATKAL TICKETS. 1 IS CONFIRMED 2ND IS CKWL1. CHANCES OF CONFIRMATION OF 2ND TICKET? 99%. If any one of the tatkal ticket get cancelled, your ticket will be automatically confirmed. First two tickets has some chances to confirm. I have booked 4 tickets CKWL in train no 12323 for 27/1/15………. can it be confirmed?? I have booked ticket ( 2AC ) from Sealdaha to New Jalpaiguri at Padatik express on 4th March,2015. Booking status : WL 4/5. What is the possibility plz tell me, else I want to catch bus. my ckwl is 48 for going clt via gharibradh is der any chance to confirm i f canceled refunded ?? Hi I have booked 2AC Nashik to Ernakulam on 21st jan and journey date is 3rd of Feb. Status is RLWL/5 and RLWL/6 . Any chances of confirmation? Please advise. Or should i go for tatkal? My PNR is 4103827145, travel date is 19th Jan 2015. The wait list status has not changed from RQWL 1 to 6 ( 6 passengers) from the time of booking. What are the chances of ticket confirmation? Thanks a lot! My Waiting list no. is 3 and 4 on 2AC. journey date on 14.1.2015. Will it confirm? My TATKAL ticket is Waiting List 32 & 33 in Sleeper Class in Guruvayur Express of 10th. Is it possible to confirm. or need to cancel? Hi, My ticket is 32&33 in Sleeper Class (SL) guruvayur express of 10th. Is it possible to confirm. or need to cancel? my ticket status is GNWL 80 to 84 in Gouthami Expresss…what are the chances..train is on 11/1/2015. Due to festive season is there any chance to add extra Bogies? my ticket ckwl 1 for brindAVAN express tomo. Will it get confirmed? I have booked ticket for 5/01/2014 (6:50am) from Hyderabad to Delhi in A P Sampark Kranti & status is CKWL2. What are the chances of confirmation please tell? mt tatkal status is CKWL 70, will i get ticket ? My ticket status to delhi is WL1/Rlgl..wat are the chances of it being confirmed. whats the chance of confirmation???? Is there chance of confirmation? my ticket is RLLW 11&12. journey is on 4th jan 2015.what is the chance i will get confirmed ticket? My tatkal ticket is CKWL 6, 7 and 8 in Anga Express from Bangalore to VZM on 3rd Jan 2015. What are the chances of confirmation. Please say what are the chances of confirmation? Sir, I have tatkal WL 4,5,6 in 3AC of malwa express from jammu to faridabad for tomorrow (02/01/2015). What are chances of it getting confirmed. MY PNR STATUS IS CKWL19 BUT CURRENT STATUS IS WL 11….IN DURANTO EXPRESS PUNE TO DELHI 2-JAN-2015..
PLS SUGGEST ME WHAT ARE CHANCES OF CONFIRMATION OF TICKET??? I have booked Tatkal in 2Ac status is CK Wl 2, 3,4 for Tomorrow 1st jan-15 Journey. Will it get confirmed. Hello. please let me know my chances of getting confirmation on tickets. udaipur express.Train number: 22901 Bandra to Mavli Junction. Please give me your advice so that i can proceed with the bookings. Thank you. Current position of my ticket is RAC-28, RAC-29,and RAC-30 for AC 2nd Class for H-Nizamuddin to Bangalore Rajdhani for 02-Jan-2015. What are the changes of getting Confirmed Ticket for these three births? My wt list tatkal general is 5 now tomoro the ticket will confirm or not.pls advice Mumbai to chennai..
i have booked 12952 rajdhani in tatkaal. current status is CKWL 4 date of journey is 30th December. Hello Admin i have booked my ticket from Varanasi to Mumbai on 17-Dec-2014. Journey date is on 29 – Dec – 2014. Hey. My train is mangala from delhi to goa on 28th dec … We have rac 4,5,6,7. Will it get confirmed? My PNR Status is CKWL 3 and 4. Train is Darjeeling Mail from NJp To Sealdah and date of journey is today 8 pm (27th Dec 2014) 2 AC what are my chances of confirmation? My ticket status is RLWL 3 for 3oth december in karnataka sampark kranthi, from hyderabad to kachiguda. does it stand any chance of confirmation? I have ticket booked for December 30th in Karnataka sampark kranti (12649) with RLWL 3 current status from hyderabad to nizamuddin. Does it stand any chances of confirmation? My train is garib raath from Jhansi to H Nizamudin with waiting list CKWL5. So please let me know will it be confirm or not my Journey date 28/12/2014. and chart will prepare today. i have RLWL/5 for Golden Temple mail from delhi ti mumbai for 27th Dec-2014 what are the chances of getting it confirmed. Hi admin my ckwl 3 is for 2nd ac in shramshakti from kanpur to newdelhi on 26.12.2014, what are the chances of confirmation. i have current waiting 46 in north east exp from anand vihar terminal to guwahati on 28 dec 14. what are the chances sir? i have current waiting 46 in north east exp from anand vihar terminal to guwahati . what are the chances sir? train-kanyakumari express from pune to trivandrum. Hi we booked 5 tickets in padmavathy express from sri kalahasty to warangal (525KM) we got PQWL 16 – 20.Our plan of journey is at 06th FEB and i booked on 26th dec.it’s showing below waiting list. is there any chance of confirmation? what are it’s chances of getting confirmed. Sorry Sanjukta. you have very less chance of confirmation. Plan for an alternative transport. Hello my ticket is tatkal waiting list of 2 in karnataka express from bangalore to delhi and tomorrow at 7:20pm. What is the chances of confirmation? Hi Rinzin, you have 100% chance of confirmation. My tckt status is RLWL/20 RLWL/19. What are its chances of getting confirmed,journey date-15 July 2014. Hi Ashu, you have very less chance of confirmation. I am travelling on 11 July from New Delhi to Chennai 2AC. I am on Tatkal waiting list CKWL 1. What are the chances of the ticket being confirmed? Hi AR, you have 99% chance of confirmation. Hi Meenu, you have 100% chance of confirmation. I have booked a train New Delhi Station to Varanasi on 21st August and one ticket is PQWL waitlisted. How do I know how high up the waiting list I am and if it has been confirmed? Plus what are my chances of confirmation?? Hey, I have got CKWL 5 in Ashram express for tomorrow (5th July 2014). Is there any chance of getting cleared? Got my tickets booked for 13 August. My PNR Status is as – Booking Status – W/L 87,GNWL. And * Current Status – W/L 66. As I am not a frequent train traveler, please explain what does this means. Is there any chance of my ticket getting confirmed. Thanks. I have booked my Journey for 3.07.2014. From new bongaigoan to howrah in saraighat express. .my tatkal waiting is 1.. what are my chances. Can u pls suggest me. Hi Avishek, 95% chance of confirmation. Sir I have booked I ticket from Bhopal to Patahankot In Jhelum Express. Date of journey is 12th Jul. Waiting is RLWL 11,12,13,14 in 3rd AC. What are its confirmation chances? Hi Anmol, 75% chance of confirmation. Should I go for tatkaal?? better you can go for it. I have booked a tatkal ticket today with ck WL 2 & 3, my train will depart tomorrow night at 7:30 pm. Is there a chance that my tickets will confirm? Hi Sreeran, since RLGn will reduce fastly, you have 99% chance of confirmation. It depends tht from which date u have booked ur ticket…? Did u check online status during this period?if there is any improvement and it comes to 28 from some large no. thn definitely there is no chance. but if there is no change digits are same from the date u have booked…and its been 15-20 days u booked thn wait till chart preparation…it might be get cleared…. Hi Amit, what is your journey date? i have booked a tatkal ticket in shram shakti express from kanpur to new delhi for 27 th june. its present status is CKWL 17, 18, 19, is there any chances for its confirmation. Current status -WL 1 & 2. 2) Chances of any of these getting confirmed?? Unfortunately none of them got confirmed. The chart status was updated just 1 hour before the departure ! This made things difficult for me, as I didn’t know what to do. But, I had alternative tickets ready, so the journey took place anyway. I have CKWL/2 tatkal waiting status for tomorrows train YPR SKRANTIEXP from bangalore to new delhi. Hi yug, You have 99% chance of confirmation. But keep in mind, CKWL list will reduce only when the tatkal tickets are cancelled. I have booked 1AC tickets from Blore to Hyderabad on kacheguda exp couple of days ago for today(06/27) and my the status is WL2,3 for last 2 days. Any chance of confirmation as my train is at 6:20 PM today ? Hi Kishore, since it is 1AC and not reduced for last 2days, you have 20% chance of confirmation. Hi Madhu, you have 100% chance of confirmation. My train is on 6 th july 2014..
Hi Juni, you have 99% chance of confirmation. I am travelling from MAS (Chennai) to NDL (New Delhi) by Grand Trunk Express scheduled at 19:15 tomorrow. Having purchased a TATKAL ticket, what are the chances of me getting a confirmed ticket. Hi Srinivas, You have 100% chance of confirmation. CKWl ticket only confirm if Tatkal tickets are cancelled. So you have very less chance of confirmation. thanks for your article …our ticket is Howrah to Puri waiting list 29 & 28 in 3A in train 12837 on July 25th, 2014…what’s the chances of being it confirmed??? Hi Sujani, since the date of journey is very near and waiting list no is high, you have very less chance of confirmation. I booked a tatkal ticket for journey date is 06/24’th for second tier AC (NIZAMUDDIN EXP) & takal waiting list are 1,2,3 what is the chance of getting confirmed ticket ,also does waiting list get improves on tatkal cancellation only or it improves if somebody cancell of general quota as well . Hi Vikas, you have 100% chance of confirmation. Tatkal tickets will be confirmed even general quota tickets are cancelled. i booked tatkal 3 ac ticket today.. it has ckwl 2… the train is tomorrow at 2:20. what’s the chances of being it confirmed??? My ticket has a PNR Status of CKWL 3 as of now in 3A class for RAJDHANI EXP. Will it get confirmed? my journey is on today @ 17:20. plz give reply. This journey is very much imp for me……. Hi Santhosh, Chance of confirmation is very less below 40%. Please plan for an alternate mode of transport. On booking my status was RLWL/1 … now its showing wl/1 in 12968(jp-madras exp.) From bhopal to chennai for date of journey 28th june 2014… will it get confrmd or i need to proceed for tatkal…??? I have wating list 1 n 2 for tonight 20.6.14 for new jalpaiguri in gawhati express so any chance of conform I m worries. ? Hi David, plan for an alternative way Since you have very few hours left for journey. I am going to Hyderbad from Nizamuddin tomorrow in Duronto. I had CKWL6 but now its converted to CKWL 2. Will it be confirmed till chart preparation. Hi Vikas, check ticket status on tomorrow morning. You have very less chance of confirmation because CKWL tickets reduced only if Tatkal tickets are cancelled. I booked 2 tickets today in 2Ac mumbai express. Pnr status is PQWL8/PQWL9. Date of journey is 18/08. Wat r d chances of my tickets getting confirmed? Please advise I’m CKWL 1 on mangla laksha from delhi to goa what is the probability of confirmation? Savio, Please include your Journey date in the query. Hi Sushant, Chance of confirmation is very less. Better you can go for Tatkal. I have ticket from pune to Narsinghpur 30th June 2ac. It’s pqwl 3 now it’s showing wl 3. Whats the chance? Hi Neerav, PQWL means pooled quota which has very less chance of confirmation. But now you have WL3, so you have 100% confirmation. Hii… i hav tickt in 12968 jp-madras express 3a/c from intermediate station bhopal to jaipur for date- 28 june 2014… i got my ticket booked 1 mnth before and from that day till now my status is RLWL/1… SIR, will it get confirmed and till which time…?? Do i need to approach for tatkal ticket…??? my waiting list is W/L 105 GNWL, 22650	YERCAUD EXP on 3- 8-2014 from erode to chennai central… is it possible to get confirmed??? Since you have two months for journey, you have 95% of confirmation. Now my GNWL is 12.. I have to board on 4 july..
hi my waiting list for tatkal for today (16th june 2014) is ckwl 2.
whats the chance of getting a confirmed one? or shld i book another one in some other train?? Don’t cancel tickets, wl reduced amazing. What is the process of getting TATKAL waiting tickets confirmed, is it only against cancellation of TATKAL tickets or also with normal waiting tickets?? Hi Mukesh, Tatkal waiting tickets confirmed against cancellation of Tatkal and also normal waiting tickets. Today i buy DELHI to PATNA TATKAL TICKET in 2AC………… CKWL/23 …. at morning……….. Now in night position is CKWL/11…………. it will confirm or not ?? Please let me know your journey date. I have to travel in chennai-bikaner SF A/C…My W/L was 57 and now its showing GNW/L-15 will it confirmed or not? Hi Yogesh, you have 99% confirmation. I have normal WL 1 for 2mrw.it will confirm or not? Will it get confirmed for tomorrow? My ticket from kolkata to kanpur 2A/C is at RSWL 1 for today. please advice the chances of confirmation.the train is kol-ndls rajdhani. the date of departure is on 10th June 2014. Hi Arijit, chance of confirmation is 100%. Don’t worry. VERY SORRY TO SAY THAT THE TICKET WASN’T CONFIRMED.THAT WAS REALLY VERY STRANGE. booked status-CKw/L 7, current status W/L 6,Mumbi Delhi Garib rath, what are the chances ? Hi Sandy, please share your journey date.? My ticket from kolkata to chennai 2A/C is at W/L 2 for today. I also booked tatkal ticket for same which is at W/L 3. please advice which one has chances of confirmation, so that i can cancel other ticket. Tatkal has high change of confirmation then normal ticket. Don’t cancel the tatkal ticket. Hi, I have booked tickets before 2 months for 12th june 2014 journey, that time my waiting list was wl1 & wl 2/PQWL, now its showing WL1 & WL2. Is there any chance of ticket confirm? Surprised, still its WL1 and WL2? Chance of Confirmation is 99%. Hi Rukshath, congrats man, your ticket will be 100% confirmed. my status is CKwl 11 from ernakulam(kochi) 2 shalimar(wb) tomorrow night.what r my chnces ne suggesions? Hi Roy, Chance is less. 90% confirmation. ..WHAT ARE THE CHANCES OF IT GETTING CONFIRMED? There is no RAC provision so less chance of conformation. 75% confirmation. My tkt from bam to Pune is rac 7 for tonight journey, will it be conform ?? my ckwl is 1 fr 2A ..will it be confirmed? Sure. Just 1 rite, it will be confirmed soon. guys what is the latest mandate for tatkal wait-listed tickets ? not true, the tatkal waitlist tickets get conformed only against a tatkal cancellation. Ramya Love Ramya hopefully your judgement is wrong, tatkall waiting only gets confirmed when there is cancellation from tatkal booking. Did you get a confirmed ticket?? Because i booked today a tatkal ticket Mumbai to Delhi. CKWL is 18. I am worried too. Ramya Love Ramya my ticket shows waiting list 14 15 16 for 27/02/2014 will this be confirmed. its from Pune to chennai. my waiting list no in tatkal is 35 for 12952 delhi mumbai rajdhani.please advice will it be confirmed.really worried.. If tatkal status is 1 , then you are first waiting list person. It will e confirmed if any one passenger cancelled his ticket. Its a confirm one. Your ticket must be confirmed. Ramya Love Ramya Cancel but only if someone who booked ticket from tatkal ? what if my waiting list under tatkal is 1 ?